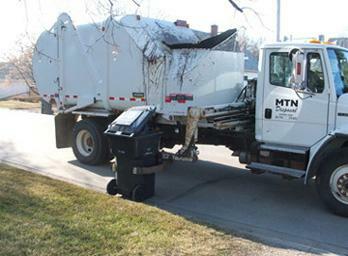 We hope that you will take a few moments to familiarize yourself with these easy to remember instructions regarding the automated refuse collection system. This system uses the latest collection equipment available and provides maximum efficiency at minimum expense. We want to do the best possible job for you and would appreciate your cooperation. To assure that you get your waste picked up, the drawings below illustrate the locations for your container on collection day. Always have the wheels of the container facing toward the curb as illustrated in drawing #1. When there is a snow bank built up along the curb, make sure the container is out further than the snow bank as illustrated in drawing #2. 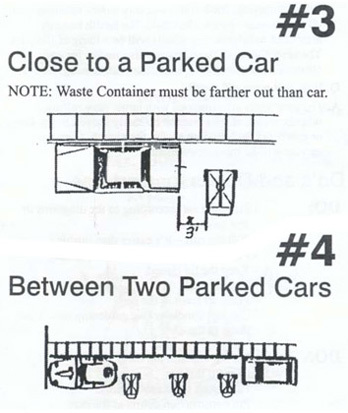 We ask that you refrain from parking on the street on collection day, however, if there are vehicles on the street, please place the container in the location illustrated in drawings #3 and #4. Wheel out your cart with its lid closed. You must be able to close the lid without packaging garbage in the cart too tightly, otherwise the excess weight will make emptying of the cart more difficult. For aesthetic purposes, the Town would prefer that the carts be stored out of sight between collection days. Do not remove the cart from its assigned address. Inform the Town of Nipawin of any damage, vandalism or theft of the cart. It is important to note the serial number stamped on the cart placed at your residence. Pull the cart—it’s easier than pushing. Store the cart close to your house or garage—not right at the curb. Put hot ashes in the cart. Pack waste in cart too tightly. Put construction debris in the cart. Paint or write on the cart. Remove the cart from your residence. If your house is on a street or avenue without a curb, please place the container on the road making sure the pickup truck can reach the container. For residents that are situated on a corner lot, the cart should be placed next to the curb which is opposite to your back alley. For your child’s safety, do not allow them to play near the collection containers or vehicle. To avoid having your container missed, please have your container out by 7:00 a.m. on collection day. After being collected, the cart must be returned to its storage location by 7:00 p.m. on collection day. Following these instructions will assist us in allowing the Town to provide Nipawin residents with efficient waste collection services. The Town of Nipawin introduced Single-Stream Recycling to the community in 2014. To learn more about your blue bin and the articles that can go into the blue bin for recycling see below. Since 1998, the Town of Nipawin has been collecting compost material from every household within the Town limits. It is estimated that during the summer months compost materials account for up to 50% of all residential waste collected. The objective of composting is to divert this material from the landfill, while converting it into a useful finished product for horticultural or agricultural use. From an environmental perspective, composting saves valuable landfill space while adding beneficial humus and nutrients to the soil. Compost collection period begins in May and concludes in October, see schedule for more details. Acceptable compost items should be placed in GREEN compost carts, garbage cans, or paper compost bags and placed within six feet of your front curb by 8:00 a.m. on Wednesdays. For residents that are situated on a corner lot, compost items should be placed on the curb which is opposite to your back alley. Please do not place compost in your MTN Black or Blue Collection Carts. NO PLASTIC BAGS OF ANY KIND. If you have any questions please call the Town Office at 862-9866. Recycling in Nipawin is managed by Handi-Works and SARCAN. SARCAN, which is operated by Handi-Works in Nipawin, is a provincial initiative providing employment in the community as well as protecting the environment by providing a place where citizens can recycle many reusable products. Handi-Works and SARCAN would like to thank Nipawin residents who participate in various ways to reduce, reuse and recycle. The following services are provided by SARCAN in Nipawin. Paint: Leftover paint can be dropped off at SARCAN year-round. Electronics: Unwanted electronics such as computers, monitors, printers, televisions, etc. can be dropped off at SARCAN.